Eggless orange muffins recipe – These are soft, moist, citrus flavored muffins loaded with chocolate chips in it. Citrus flavored baked goodies are our favorite. You will find many recipes e.g. lemon cake, orange cake, lemon pistachio cookies, lemon cupcakes and so on. I do bake a lot but lately I am not sharing that many eggless dessert recipes here on the blog. The reason is I bake things during the weeknights not the weekends. So I am not able to take photos. But these eggless orange muffins with chocolate chips I baked today morning again. Since today is Thanksgiving holiday, I am able to take the photos. These are hubby’s favorite. I have been making these since last few years. Citrus orangey flavor and chocolate is the BEST combination. Have you tried my chocolate orange cupcakes with orange flavored cream cheese frosting? If not you are missing something. These muffins are perfect for breakfast or snack time!! Since these have chocolate chips in it which adds extra sweetness. So this can be served a dessert too. You can drizzle the orange glaze on top to make it extra special. 1) Preheat the oven to 400 degrees F or 200 degrees C for at least 10 minutes. 2) Line a muffin tray with cupcake or muffin liners. Or you can grease or spray with non stick cooking spray. This recipe makes 8 muffins. 3) Take dry ingredients (all purpose flour, whole wheat flour, baking soda, salt and sugar) in a bowl. NOTE: if using salted butter then skip the salt here. 4) Whisk well till everything is well combined. Keep it aside. 5) In another large bowl, take melted butter. 6) Add milk and yogurt. Make sure milk and yogurt are at room temperature. 7) Beat it well till everything incorporated. 8) Now add orange juice and zest. 9) Again beat it very well. 10) Now add dry flour mixture. 11) Start mixing using wire whisk and half way through switch to spatula. Mix till everything is combined. Do not over mix. 12) Now add chocolate chips. 14) Divide the batter into prepared muffin tray. Fill them only ¾ full. 15) Bake into preheated oven for 20-22 minutes. Check by inserting a toothpick in the center of the muffin, if it comes out clean then muffins are ready. Remove them from the oven and let them cool in the pan itself for 5 minutes. 16) Then transfer them to a cooling rack and let them cool completely. 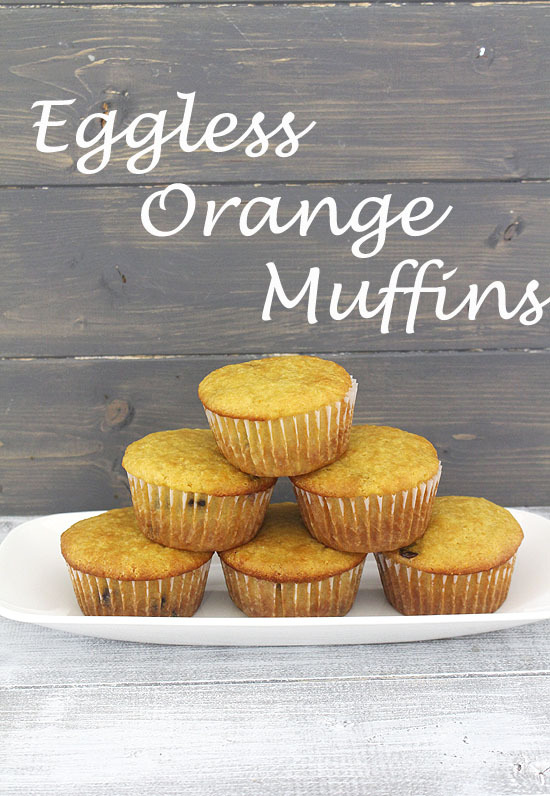 Serving suggestion: Enjoy these eggless orange muffins as a breakfast or dessert. 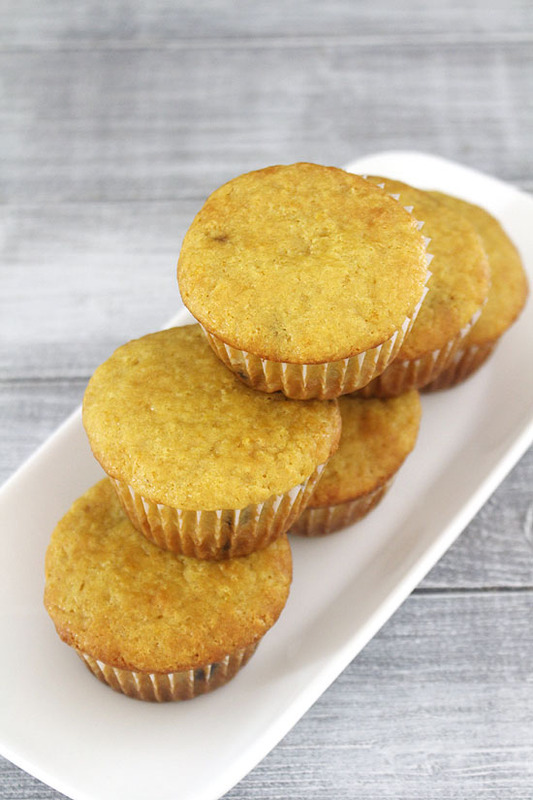 Eggless orange muffins recipe - these egg-free muffins are soft and moist. It has full of orange flavor with added chocolate chips in it. Preheat the oven to 400 degrees F or 200 degrees C for at least 10 minutes. Line a muffin tray with cupcake or muffin liners. Or you can grease or spray with non stick cooking spray. This recipes makes 8 muffins. Take dry ingredients (all purpose flour, whole wheat flour, baking soda, salt and sugar) in a bowl. Whisk well till everything is well combined. Keep it aside. In another large bowl, take melted butter. Add milk and yogurt. Make sure milk and yogurt are at room temperature. Beat it well till everything incorporated. Now add orange juice and zest. Again beat it very well. Now add dry flour mixture. Start mixing using wire whisk and half way through switch to spatula. Mix till everything is combined. Do not over mix. Now add chocolate chips. Fold them in. Divide the batter into prepared muffin tray. Fill them only ¾ full. Bake into preheated oven for 20-22 minutes. Check by inserting a toothpick in the center of the muffin, if it comes out clean then muffins are ready. Remove them from the oven and let them cool in the pan itself for 5 minutes. Then transfer them to a cooling rack and let them cool completely. good to know that muffins came out good. 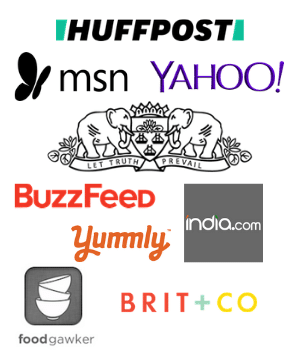 Sure will share more muffin recipes. Awesome recipe for muffins. However, a few choco chips would make them even more delicious. What are your thoughts about it? It already has chocolate chips in it. and you are asking about my thoughts. did you even read the recipe? Or just trying to promote your site which has stolen pics from other sites. What is the orange Zest. if it is not possible then what should we add? Zest is outer layer of the orange skin. use the fine grater and grate the only orange part of the skin. Do not grate the white part that is bitter. Sure give it a try. The one with eggs are best but eggless are good too. This looks nice.I hope I can try this.